I needed to do some further photoshop work on this piece as I had left the composition some weeks previously with the boat facing the other way. I felt sailing into the composition worked better than sailing out. This was important but meant the shadows and typography were the wrong way round – stuff to correct while painting. I’d previously extracted the foreground boat from being snug up against the central blue boat. This gave the painting more depth. I really like the contrast between the opulent high rise living to the scurrying life around the boats. As with the other rural pieces I became besotted with the detail and any expressionistic speed was rapidly rejected for the plodding excitement of masking tape strips and rigger-ous detail. 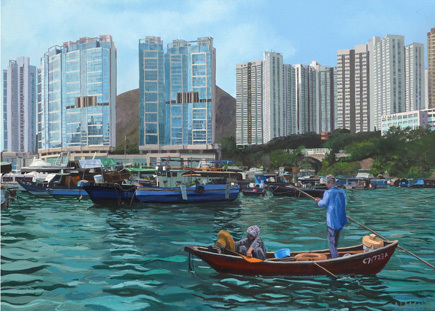 Quite pleased with this one, think I’ve successfully caught a fascinating part of Hong Kong.